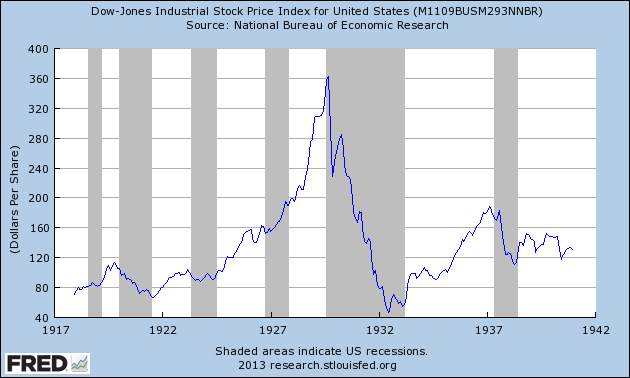 The last century proved that the economic recovery requires a liquidation of the market. In 1916, the U.S. was on the verge of entering World War 1. President Wilson needed access to the Fed’s ability to create money to fund the war. The Federal Reserve Act was revised to allow the Fed to hold treasury bonds. Banks would subsequently buy the treasury bonds and give them to the Fed as collateral in exchange for loans at a discount rate of 3%, which was a whole point below the normal rate. The low interest rates resulted in a massive expansion of the money supply. From 1916 to 1920 the money supply doubled from $4 billion to nearly $8 billion. As a result of the doubling of the money supply, prices also roughly doubled. 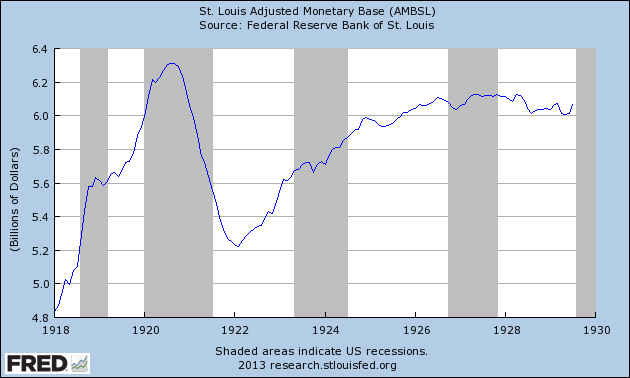 After the War, the Fed pulled back the money supply by raising rates to 7%. Consequently, in 1920, there was an economic collapse so severe that the unemployment rate jumped from 4% to 12%. The business world reflects the disturbance of war’s reaction. Herein flows the lifeblood of material existence. The economic mechanism is intricate and its parts interdependent, and has suffered the shocks and jars incident to abnormal demands, credit inflations, and price upheavals. The normal balances have been impaired, the channels of distribution have been clogged, the relations of labor and management have been strained. We must seek the readjustment with care and courage. Our people must give and take. Prices must reflect the receding fever of war activities. Perhaps we never shall know the old levels of wages again, because war invariably readjusts compensations, and the necessaries of life will show their inseparable relationship, but we must strive for normalcy to reach stability. All the penalties will not be light, nor evenly distributed. There is no way of making them so. There is no instant step from disorder to order. We must face a condition of grim reality, charge off our losses and start afresh. It is the oldest lesson of civilization. I would like government to do all it can to mitigate; then, in understanding, in mutuality of interest, in concern for the common good, our tasks will be solved. No altered system will work a miracle. Any wild experiment will only add to the confusion. Our best assurance lies in efficient administration of our proven system. Harding’s response to the economic crisis was simple: the government reduced its budget by over 50% in two years and cut taxes. Although not perfect, Harding simply let the market go through the necessary liquidation. There were no bailouts, no government stimulus, no unemployment benefits, no unions, no minimum wage or other interference in the labor market, and the Fed kept the discount rate at 7%. Wages dropped an average of 19% in one year. The unemployment rate was down to less than 7% by the end of the year. The following year, the unemployment rate was just 2.3%. The fall in wage rates did not result in a decreased standard of living. Market forces also resulted in prices dropping 18-32%. The fear of falling wages comes from the confusion of money with real wealth, the goods and services satisfying our needs and wants. Thus, while wages and prices both fell, the standard of living remained the same because the purchasing power for goods and services remained the same as employment increased. In the mid-1920s, things changed. President Coolidge pursued a policy of lowering discount rates and appointed members to the Fed who supported his policy. The Fed kept discount rates below market levels throughout the 1920s and dramatically increased bank reserves. During the 1920s, bank credit increased by 63%. This massive increase in bank credit led to the economic roar of the 1920s. It is clear that the crisis must come sooner or later. It is also clear that the crisis must always be caused, primarily and directly, by the change in the conduct of the banks. If we speak of error on the part of the banks, however, we must point to the wrong they do in encouraging the upswing. The fault lies, not with the policy of raising the interest rate, but only with the fact that it was raised too late. In contrast, Irving Fisher, who is highly revered by today’s establishment, stated on September 5, 1929 that “there may be a recession in stock prices, but not anything in the nature of a crash . . . the possibility of which I fail to see.” On October 17, 1929, Fisher said stocks had reached a “permanently high plateau.” In fact, to prove his point, Fisher invested the majority of his own wealth in the stock market. Shortly thereafter, the market crashed as Mises forecasted and a depression arose. Fisher was financially ruined. After the 1929 crash, the unemployment rate went up to 8.6%. In contrast to the myth that he was laissez-faire, Hoover responded with massive government intervention and called for a cheap credit policy by the Fed. During the week of the crash, the Fed, in an unprecedented move, added $300 million to bank reserves, doubled its holdings of government securities, and reduced its discount rate from 6% to 4%. The Fed eventually reduced the discount rate to 1%, a record low at the time. Hoover was determined to avoid the market liquidation. Under the belief that a drop in consumer spending would harm the economy, he compelled business leaders to keep wages relatively constant. Hoover also enacted various public works projects; constructed massive farm subsidies; passed the Smoot-Hawley Tariff to impede foreign competition; created programs to foster home ownership; made loans to states, businesses, and banks; and weakened creditors’ rights in bankruptcies. Hoover also increased government spending by over 40%. With a $2 billion deficit in 1931, Hoover and Congress passed one of the largest taxes in history, the Revenue Act of 1932. Taxes on income were doubled, credits were eliminated, and surtaxes and corporate taxes were increased. Despite the enormous tax increases, tax revenue declined. Your thesis is that the government expenses can be reduced by $2 billion –the amount of the tax decrease. This is . . . wholly impossible. It would mean we must give up the postal service, the Merchant Marine, protection of life and property and public health. We would have to turn 40,000 prisoners loose in this country; we would have to stop maintenance of rivers and harbors; we would have to stop all construction working going in aid of unemployment; it would mean abolishment of the Army and Navy. In other words, it means complete chaos. The proposed spending cuts would have merely reduced government expenditures and services back to the amount provided during the 1920s. Creating new jobs and giving to the whole system a new breath of life; nothing has ever been devised in our history which has done more for the . . . common run of men and women. Some of the reactionary economists urged that we should allow the liquidation to take its course until we found bottom . . . We determined that we would not follow the advice of the bitter-end liquidationists and see the whole body of debtors of the United States brought to bankruptcy and the savings of our people brought to destruction. We have tried spending money. We are spending more than we have ever spent before and it does not work. . . . We have never made good on our promises. . . . I say after eight years of this Administration we have just as much unemployment as when we started . . . and an enormous debt to boot! Prosperity did not return until after World War 2 ended. The government massively reduced its spending and war factories were converted into factories for producing capital and consumer goods. Ludwig Von Mises, Monetary Stabilization and Cyclical Policy, p. 131 (1928). Irving Fisher, New York Times, Sept. 5, 1929.